in our lives—if not for ourselves, then for those who depend upon us. I recently had the opportunity to whittle down my “must read” stack of books on the end of my desk. 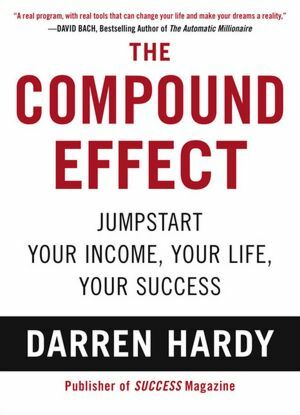 This week I finished one from the stack: The Compound Effect by Darren Hardy. The short message in Hardy’s book is simple enough: Our life is made up of little choices we make each day of our lives. While each choice on its own may appear small, they add up—they compound over time to create who we are. I enjoyed Hardy’s book for a number of reasons not the least of which is that it reaffirmed my writings and teachings. In Choices for College Success (2nd edition, Pearson Education, 2011) I make the point that it’s great to have dreams but without action the dreams become fantasies. The old adage holds: What you are doing speaks louder than what you are saying. Visualize your most favorite spot in your home; the place where you are able to relax, unwind, and recharge. Perhaps it is a comfortable chair; maybe it’s your bed. Now visualize that I walk into your home and go directly to that prized location of yours. Once there, I dump the largest, slimiest, and most putrefied pile of garbage you can imagine. Right on your favorite spot! Well, predictably, they are not pleased with that visual. They are bothered that someone would despoil something so personal and meaningful to them. I then ask them why they would consider dumping garbage into their minds. I ask, “If you would not allow me to place garbage and unhealthy items on a thing (your favorite chair in this instance), why would you put those things into your mind?” The point is made. Hardy addressed a similar point in his chapter titled “Influences.” He used the metaphor of two glasses of water: one clean and clear; the other dirty and murky. The clean one represents our minds fed with wholesome, positive, good, and uplifting information. This could come from “good” news, “good” books, “good” acquaintances, and “good” habits. However, when we fill our minds with gossip, mean-spirited talk, ranting radio/television shows, or the evening news filled with chaos and mayhem the result is anything but a clean drink of water. The result: a dirty glass. And now, with nothing but dirt as the filter, that is how we will tend to view the world. It can have an adverse impact on our relationships, our creativity, or physical healthy, and our emotional wellbeing. We may end up being more fearful than hopeful; more scared and closed to the world than optimistic and open to possibilities. See the video below for a demonstration—a metaphor—that may help you visualize this situation-and what you can do about it. Whether you have to limit your news intake, pass on the water cooler gossip, replace the tabloid with a solid piece of literature, and/or have a positive conversation with someone you love, make it a point in 2012 to search for the positive, focus on the positive, and lead a more positive life. This does not mean we should turn away from the problems of our world. As part of our larger community we have an obligation to help it and nurture it to an ever better place. But we also need to be mindful of the balance needed in our lives—if not for ourselves, then for those who depend upon us. Your small choices will create your larger life. This entry was posted in Balance, creating your future. Bookmark the permalink. This is so true. Having a negative vs. positive attitude can make a huge difference in your life. Having a negative mindset yields inactivity and ultimately, to you yourself not pursuing or achieving your goals. You assert to yourself “I can’t do this” or “There’s no way I can do this!”. However, with a positive attitude, you tell yourself, “I can do this!” and “Nothing’s going to keep me from achieving my goal!”. Then, on down the road, you will either: a) achieve more and have compounding happiness from this due to your positive outlook or b) have compounding sadness due to your negative attitude because you talked yourself out of pursuing your goals or didn’t pursue them. Now think about why the aforementioned happened… This happened as a direct result of your own mindset! This phenomenon can create a bleak or positive future for yourself. Will you let your seemingly small negative or positive choices decide your future? Will your negative attitude cripple your future or your positive attitude help create your own personal nirvana? Nobody can live your life for you, so you have to make up your own mind about how your outlook on life will be. Are you willing to let your mindset make your future for you and if so, will you be content with that future you created? Thanks for your insight, Spencer!